Stocks inched higher last week to rebound slightly from the prior week's sharp drop. 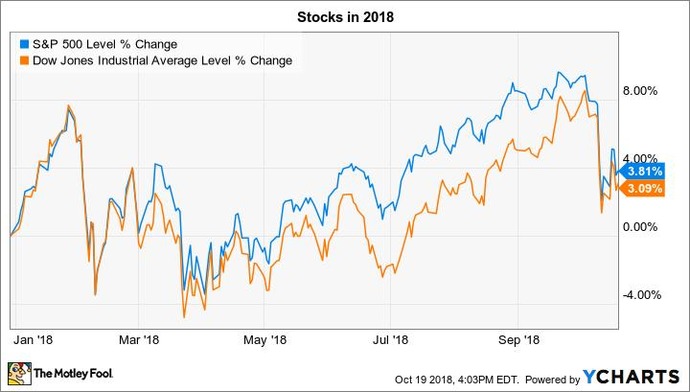 That left both the S&P 500 (SNPINDEX: ^GSPC) and the Dow Jones Industrial Average (DJINDICES: ^DJI) below record highs, but still up more than 3% so far this year. Hundreds of companies are set to post third-quarter earnings reports over the next week. Below, we'll take a closer look at the announcements that could send shares of McDonald's (NYSE: MCD), iRobot (NASDAQ: IRBT), and Amazon (NASDAQ: AMZN) moving in the trading days ahead. McDonald's announces its results before the opening bell on Tuesday in a report that should tell investors a lot about the health of the global fast food industry. The chain has continued its impressive growth rebound, but that recovery has been looking less robust over the last six months. Sales gains slowed to 4% last quarter, in fact, as McDonald's struggled with softening demand in the U.S. market. That stumble means investors will be interested in the chain's customer traffic numbers in the domestic market, which slipped into negative territory in each of the last two quarters. CEO Steve Easterbrook and his team plan to push that metric higher, mainly through initiatives like store remodels, menu upgrades, and digital ordering offerings. These moves have helped speed growth in many of Mickey D's international markets, including France and Japan, so the company is confident the changes will eventually translate well to its most mature segment. Thanks in part to a banner outing during Amazon's Prime Day sale, investors are already optimistic that iRobot will post solid third-quarter sales results on Tuesday afternoon. The robotic cleaning device specialist said in late July that it sold out of its Roomba products during the Amazon event despite doubling the quantity of available devices. That boost is a key reason investors are looking for sales gains of about 19% for the quarter. iRobot's profitability will be in the spotlight since the strength of its gross and operating profit margins should reflect whether the company is feeling more pressure from the flood of new competition entering the market lately. Yet investors will be even more focused on the company's updated outlook heading into the core holiday shopping season. On the bright side, iRobot has a fresh lineup of devices it can market toward consumers who are increasingly open to the idea of having robotic cleaning products in their homes. That optimism might be tempered somewhat by rising manufacturing costs due to tariffs hitting many of the company's key inputs. A batch of strong earnings reports so far this year have helped Amazon's stock soar despite a roughly flat outing for the broader market. That means the e-commerce titan has a high bar to clear when it announces its results on Thursday afternoon. Its last report was highlighted by a 39% sales spike that by itself might have been enough to spark a rally in the stock. Investors were even more pleased to hear about Amazon's 1,168% profit increase, though, as earnings more than doubled Wall Street estimates to land at $5.07 per share. This time around, Amazon has predicted revenue of between $54 billion and $57.5 billion, which would mark growth between 23% and 31%. Investors are hoping to see more evidence of pricing power at its AWS cloud services segment. They're also expecting an optimistic outlook from CEO Jeff Bezos and his team as they look out to what's likely to be another record holiday season. John Mackey, CEO of Whole Foods Market, an Amazon subsidiary, is a member of The Motley Fool's board of directors. Demitrios Kalogeropoulos owns shares of Amazon and McDonald's. The Motley Fool owns shares of and recommends Amazon and iRobot. The Motley Fool has a disclosure policy.